Whilst I cover skincare frequently on Florence and Mary I am no expert. Of course over the course of testing and trialling products I am able to review on these pages and make recommendations for friends, learning more and more about the ingredients that make up some of our favourite products. 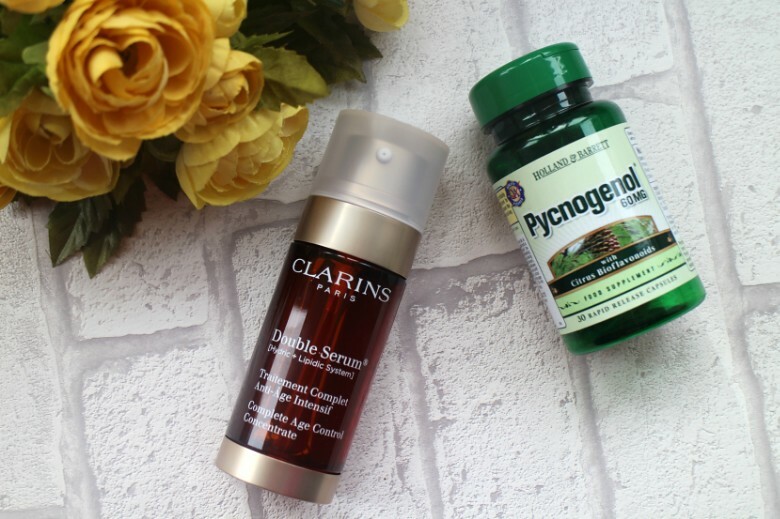 A new ingredient I have recently learned of is Pycnogenol, used in many skincare products such as Clarins Double Serum* but can be taken in supplement form available from Holland & Barrett. I could of course recite all the clinical studies that have been carried out and blind you with science but in short Pycnogenol is 50 times more potent than Vitamin E and 20 times more powerful than Vitamin C and whatever for you choose to take it, it will enhance skin skin elasticity and leave you with healthy glowing skin. 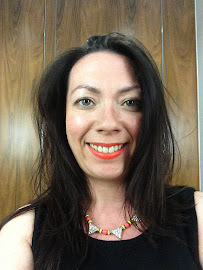 I was asked to take the Pycnogenol supplements whilst using Clarins Double Serum and report back on my findings. There are a number of things I can state from my experience before talking about the products further. Using the serum was easily done. It slotted into my skincare regime easily and worked alongside other products I was testing. It was quite a nice experience to use a product in its entirety before switching to something new and you will see it appear in my monthly empties post. Using the supplements was less easy to get used to. I found that putting them on my desk at work helped as I would take one before lunch but I did forget here and there. I've never been someone to readily take supplements so this was a new experience to me and these aren't something 'cheap' to pick up but if used properly in comparison to the cost of some skincare products or if you're not particularly into your skincare it could easily be an alternative. Over the month period in which I used these products I was pleased with the results and can still see them paying off. Pycnogenol will even increase the presence of Hyaluronic Acid and Collagen in the skin, which if you read my earlier post about Hydrating Skincare from Pixi you'll know I'm often keen for a boost in those areas. I certainly found that my skin looked better in appearance, more luminous and any lines were less evident. I often talk about skincare and say it's often hard to say what is and isn't working, and what results would or wouldn't be evident using just a basic regime but I can't deny that despite late nights, exposure to the sun - another benefit of using Pycnogenol is prevention of UV damage - and all the other stresses I put my skin through I've had none of the usual side effects evident. It's interesting to note that as I type this post and have come to the end of the trial I'm finding one or two of the other niggles rearing their head whether it's dry patch or a new line deepening. I'm keen to explore this trial further, wondering whether I can use the supplements alongside other serums in my skincare cabinet and I'll still see the benefits - I just need to remember to take them regularly! Do you regularly use skincare supplements or is this a new concept for you? I've definitely found, or certainly it seems like they have helped. And as I said in the post I was somewhat sporadic with how I took them.